The ancestral castle is under attack! You must master the invaders and defend your legacy in Medieval Defenders, a shiny gem of a tower defense strategy game. If you like this free game, try Landgrabbers. The ancestral castle is under attack! 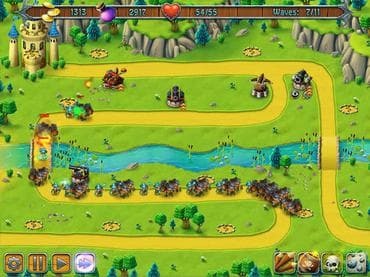 You must master the invaders and defend your legacy in Medieval Defenders, a shiny gem of a tower defense strategy game. Show a bold and strong front as you deploy just the right weapons in just the right strategy to bring down your enemy. The march toward the castle is on, and there is no time to delay. Build towers, collect coins and exlixirs, train your spells, and vanquish your enemy. This dark time of war offers no solace. Do not leave your treasures and weapons lying idle when your castle needs you. Your lands are wide and bountiful, and your power is mighty and strong. With keen foresight and sharp strategy, defeat your warlike neighbors and remind them who is in power. Deploy your best strategy when you download free full version of Medieval Defenders today! If you have questions about Medieval Defenders game, please contact us using this form.